This is a good, straightforward match. Mahal started off very aggressively, catching Swagger off-guard. The bulk of the match consists of Swagger fighting back from that early disadvantage. I like it. From RAW, Finn Balor has to relinquish the Universal Title. From RAW, Charlotte celebrates her title win. Brock Lesnar destroyed Randy Orton at Summer Slam. This match was pretty fun. Bo Dallas stood out the most, mostly for his comedy interactions with both Goldust and R-Truth. The match wasn’t terribly competitive, but I suppose that wasn’t really the point. From RAW, Jericho faces Reigns to decide who will be the last person to compete for the Universal Title next week. 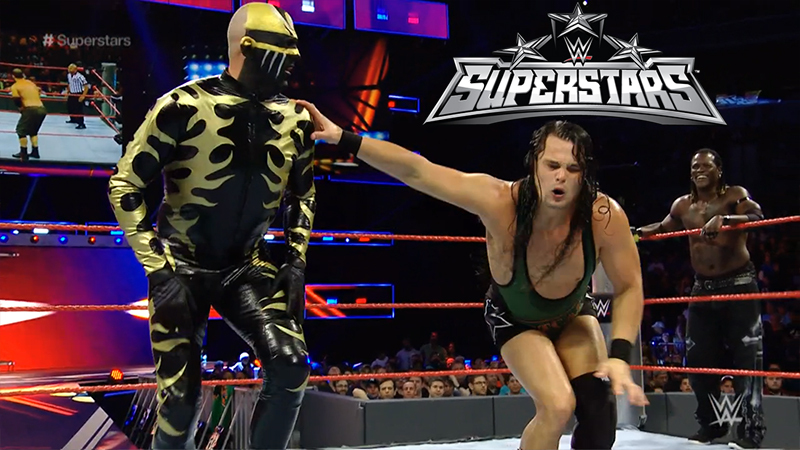 Not a bad episode of Superstars. I liked both of the matches. This was a difficult decision since I like both matches pretty much equally but for very different reasons. I think I’d probably go back and watch the Swagger/Mahal match more because it was just a solid match as opposed to mostly comedy.